We welcome the fact that the Presidency will focus on Roma integration. We ask the Presidency, through the proposed Council conclusions, to urge member states to adopt horizontally anti-discrimination legislation in the different fields (i.e. education, health, housing and employment) of their national system and implement their anti-discrimination legislation at national level. Additionally, all necessary measures should be taken to combat increased levels of hate speech and anti-Gypsyism, the latter being the main cause of discrimination and marginalisation of Roma. We ask the Presidency to use the opportunity of the proposed Council conclusions on the Youth Guarantee to ensure that such measure does not reproduce the vicious circle of poverty and exclusion of disadvantaged youth, such as the Roma. To ensure that the Youth Guarantee is inclusive and targets all youth, some key challenges need to be overcome: tackle discrimination and stereotypes of employment services and employers by providing cultural sensitivity training; provide assistance for registration process by facilitating access and providing mediation services to assist those who need; and promote ethnic data collection. In light of its commitment to focus on the European pillar of social rights, the Presidency should ensure that the Pillar includes social key principles and values addressing people in disadvantaged situations such as the Roma. The current refugee situation is having a strong impact on Roma inclusion at different levels. It is spreading panic and a feeling of insecurity which is fuelled by extreme right nationalist and populist parties resulting in increased hate speech and racism towards Roma. Moreover, Roma inclusion slipped down the political agenda as many officials are using the refugee situation as an excuse to stop or delay the implementation of the 2013 Council recommendation on effective Roma integration measures. We ask the Presidency to urge member states and local authorities to strengthen their commitment to Roma inclusion which should be considered as a priority in their political agenda and not as in competition with the refugee situation. As a consequence of the current migration crisis and Brexit, EU enlargement will most probably be delayed and will not take place soon. Since a large Roma population lives in many of the EU candidate countries and their situation is worse than in the rest of Europe, this community will be greatly affected by current developments. Thus, we urge the Presidency to ensure the commitment of candidate countries to meet the EU acquis communautaire of promoting Roma integration and to pressure them to transpose and implement the EU Framework for National Roma Integration Strategies at national level or to adapt existing national strategies to European Commission’s and Council Recommendation’s requirements as well as the Race Equality Directive 2000/43 and the Framework Directive 2000/78. The transposition of the EU Framework and anti-discrimination legislation would be facilitated with their EU membership where they would directly benefit from opportunities to EU funds to effectively implement their Roma national strategies. ​Budapest, Tirana, 7th July 2016: If you are one of the children institutionalised in the care home for children in Shkodra, you are probably Roma or Egyptian. More than half the children there belong to these minority groups, which make up only a fraction of Albania’s overall population. To be a Romani or Egyptian child in state care means a childhood apart from your family with little to no chance of returning home. It also means being exposed to a higher risk of abuse. The ERRC, along with the Centre for Legal Civic Initiatives, the Children’s Human Rights Centre of Albania, and Tirana Legal Aid Society, submitted a complaint to the Commissioner for Protection from Discrimination on 7th July detailing how the overrepresentation of these groups of children constituted indirect discrimination against them. This comes after a draft report from the Ombudsman released on the 30th June which found serious violations and abuses committed by those running the School Children’s Home, Shkodra. Among many other failings, they are treating the Romani and Egyptian children living there in a discriminatory way. A person presenting herself on Facebook as "Bára Fictumová" now awaits criminal investigation after two Romani people, the well-known activist Jan Čonka and journalist Patrik Banga, filed a report of criminal activity over a post on that page. 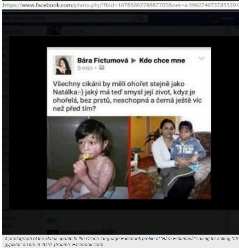 Fictumová has sadly now become famous on Facebook by posting the following message: "All gypsies should be set on fire just like Natálka, what sense does her life make when she is burned, fingerless, incapable and even blacker than before?" The remarks were posted in a group called "Who Wants Me?" ("Kdo chce mne“). Photographs of the victims of the April 2009 arson attack on a Romani family's home in the Czech town of Vítkov, to which the post referred, were posted beneath the text. Banga and Čonka are convinced that three different offenses have been committed through this post: Defamation of an ethnic, national, racial or other group; incitement to hatred against a group; and approving of a felony. ​The Romani Cultural & Arts Company is unique as an organisation. We are 100% Gypsy, Roma & Traveller led and managed; staffed by the very community our organisation seeks to serve. We have always been ideally-placed to directly consult with our community on matters of significance. Our deep connection enables trust and a common understanding with the GRT communities that is unrivalled. This is why we are so successful at the ground-breaking work we do with Gypsies and Travellers. In January 2016, we were very lucky to receive a grant to conduct some research on Gypsy & Traveller caravan sites throughout Wales, focused on gaging the opinions and aspirations of some of the most marginalised, vulnerable and abandoned members of Welsh society. As, I am sure you are fully aware, the gap between Gypsies and Travellers in terms of educational attainment, employment, housing, income, life chances and mortality and the rest of Wales remains significant with many young people abandoned and failed by schools and local authorities who in some cases, make no provision for site-based children at all and are often even totally unaware of the actual numbers of children and young people living on local authority sites. I am pleased to attach the brief report from the consultation programme that took place between January and May 2016. In particular, I draw attention to page 59 onwards. Please also forward the report onto any contacts that it might interest. The European Platform for Roma Inclusion will take place on 29-30 November. Within this context the European Commission is launching an online consultation process which will contribute to establishing the agenda for the European Platform for Roma inclusion. For this year's Platform, the European Commission (in its mission of fostering a balanced and inclusive consultation process) puts forward only the topics which have been commonly identified by the consulted stakeholders. Consequently, the Commission now invites you to identify the topics which you consider of most relevance within the context of the European Platform for Roma inclusion taking into account the political priorities both at European and National level with a focus on Roma needs at local level. We kindly ask you to disseminate the survey link to as many stakeholders as possible (including National, Regional and Local Authorities, Civil Society and Roma Communities). Please bear in mind that the deadline for submission is 9th September, 2016.